Wooden spoons are much more than essential tools in my kitchen. 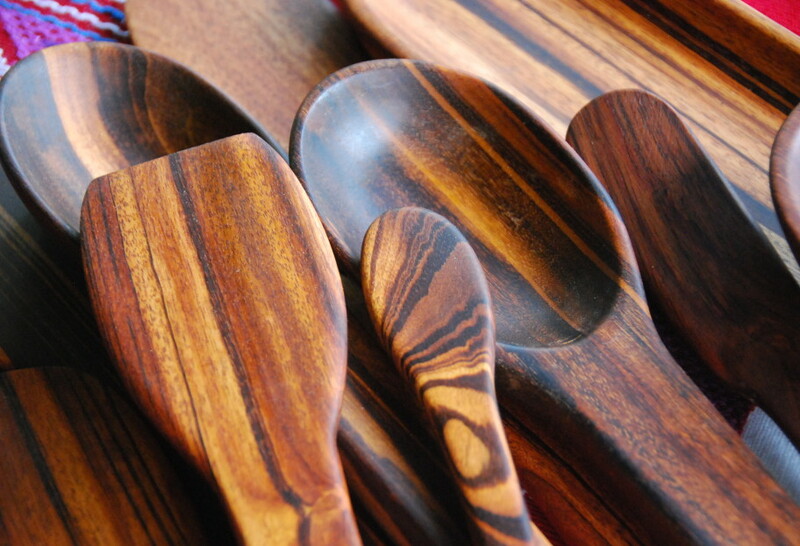 There is not one but many reasons why wooden spoons have been used for centuries and continue to this day. Not only are they beautiful, but they are also good natured: they do not scrape or damage pots and pans. What’s more, they don’t absorb flavoring, so you can use them for something salty and then after a wash, use them for something sweet. The spoons I have fill my kitchen with meaning, as they tell me stories from where I found them and where they come from. They connect me to those places and age with me, as they last so long. These pictured gorgeous spoons come from the middle of the jungle in the Montes Azules Biosphere Reserve in the Southeastern state of Chiapas. They are handcrafted, made one by one, by the Hernandez family. Last December, we visited the area and stayed at the Eco-friendly hotel of Las Guacamayas. And there was Sandra Hernandez with her stand of wooden spoons and bowls. I got a couple the first day and then went back the next to get some for my mom and sisters, and …the day before we left, I ran back to get some more for my friends. Mexican wooden spoons come in all shapes and sizes for all cooking needs. Sandra’s family makes theirs from Jobillo and Rokssul wood. Most of them are incredibly practical from big heavy spoons with large handles and deep bowls for making beans and soups, to flat and straight spatulas. There are also some with an inclined edge that aligns with the way the arm moves as it stirs a pan for such things as scrambled eggs. See the smallest one up there? So small and cute. Sandra recommended for spreading butter or jam. Although that little one may not seem so practical, it is a pleasure to use and it makes me smile each time I do. Hola! Do you have a kitchen line? I love your style and kitchen accessories you use. Also, I love your clothing. I’ll be your first customer if you ever decide to partner up and sell items. Gracias! I would love to have a few. Do they sell them here in the states? Oh I’m not sure, Pam. Maybe check online. How could I get them, they are so beautifully made. Those are gorgeous. I want them all! Those are beautiful! Wish I could order some from them!!! I love these. Each one is like a fingerprint—completely unique. Oh that is a great description, Judy! 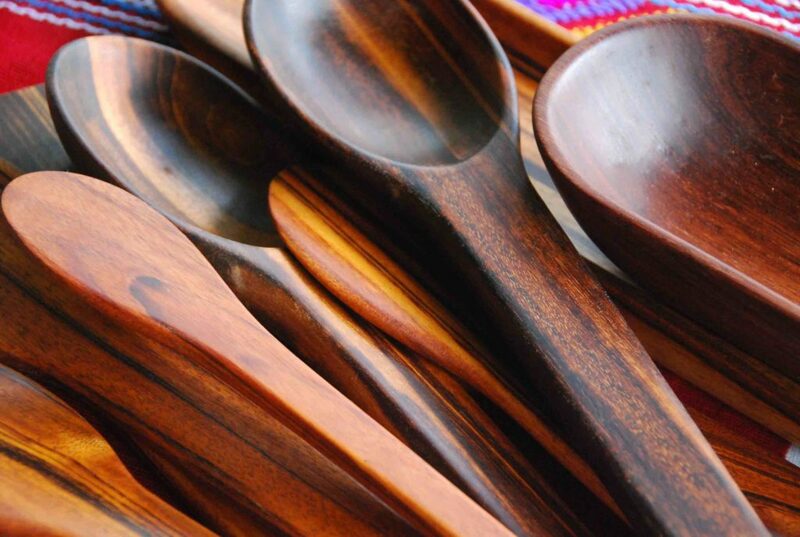 as you may know, but to benefit you readers, these hardwood jobillo spoons can also be found in chetumal, the capital city of the state of quintana roo. there is a little store located downtown inside the maya museum which sells, not only hardwood spoons, but also many other hand made wooden art made by local artisans. Hay alguna tienda en internet que recomiendes para comprar cucharas de madera? I just found your show I love the paddle looking spoon you use it’s wide at the top and flat on the bottom. Where did you get that one? Do I just search for “paddle spoons”? Thank you! Can’t wait to make the bricklayer beef tacos with bacon, brilliant. I also added a tortilla press and warmer to my Amazon Wishlist, thank you for the inspiration. Hi Jolleen, I got my wooden spoons while visiting Mexico in the state of Chiapas. They were handmade by a local family! You can read more about them here: http://patijinich.com/2012/03/wooden_spoons/. Also, I would search “flat headed wooden spoon” to find a spoon similar to the one you mention. All the best to you! Hi Stephanie, Thank you so much for watching the show — I really appreciate your positive feedback!! The pots are made by Bialetti. Those are some beautiful spoons. I seen them everywhere down here but I don’t have as many as I should. This weekend I’ll changed that! Very nice piece I love my wooden spoons. Are the spoons you got in Mexico available online? Those spoons are absolutley the most beautiful! I love them so much, I need to go to Chiapas right now! I really wish I could, but one day when I visit, I will have these on my list to buy for me and all of family and friends. They are gorgeous. I feel similarly about my spoons! In particular, the one my mother sent me off to college with that she had used for decades.